Throughout their history the Cardinals basketball team had a somewhat aggressive approach towards recruiting new players onto the team, and had a serious, no-nonsense training programme. Cardinals had few sponsors. Beginning with Caroni (Rum), they were later sponsored by Gabriel's Cash-n-Carry (Supermarket), and then Dominica Coconut Products (DCP) from 1985 through 2004. The team also maintained their uniform colours of gold-and-black or gold-and-purple. Cardinals were often popularly referred to simply as "Caroni", even while under other sponsors. In the late 1990s the club introduced a Division I (second level) team, which was sponsored by Barbados Fire & Commercial (Insurance Company); these "youngsters", however, did not fare out too favourably. Over the almost four decades of their existence, Cardinals produced quite an impressive line-up of players who represented The Nature Isle with distinction on our senior national basketball team. Players such as Derek "Didi" Alexander, Derrick "Dr. Rats" Birmingham, Ronnie Bruno, Caesar "Za" Emanuel, Leslie Emanuel, Sefton Grell, Clem Jno. Baptiste, Curtis "Long Boy" John, Mickey Joseph, Trevor "Hola" Knight, Fletcher LeBlanc, Wilmoth "Plastic" LeBlanc, Irving McIntyre, Lester Mitchel, Patrick "Pembo" Pemberton, Jason "Bounji" Richards, Charles "Charlo" Roberts, Peter "Black" Skerrit, Bernard "Kiwi" Thomas, Herbert Thomas, Cuthbert Williams, Irving "Tosh" Williams, Kent "Cat Fir" Williams, Sherwin Williams and Heskeith "Bulldog" Winston, all proudly wore Dominica's national colours. "Caroni's" first player/coach was Herbert Thomas, and over the years no less than six individuals who had sported Cardinals' uniforms went on to coach Dominica's National Basketball Teams, in the persons of Herbert Thomas, Wilmoth LeBlanc, Bernard Thomas, Patrick Pemberton and Mickey Joseph in that order for the senior team, and Derek Alexander for the junior team in 2016. Like all sports teams in Dominica – including basketball, Cardinals had players who came from or proceeded to a wide variety of occupations or professions. A few individuals of note are Dr. Irving McIntyre, medical doctor; Patrick Pemberton, accomplished musician and Calypso Judge; Irving Williams, current Comptroller of Inland Revenue; Dave Baron, General Manager, Paramount Printers; Charles James, current Editor of The Sun newspaper; and Dr. Herbert Thomas, retired Professor of Economics at Roxbury College in Boston, Massachusetts, USA. The team had other players who became members of the Police Service (overseas), Customs Service, the Tourism Sector, businessmen etc. It should be noted too that Cardinals was Dominica's first sports team/club to have one of its members, in the person of Bernard Thomas, going off-island on a sports scholarship. Also, in 1970, Wilmoth LeBlanc, then captain and coach of Dominica's State Team, undertook a short training course / assignment in Miami, USA. Then, in 1975, four members of that legendary team, viz. Trevor Knight, Clem Jno. Baptiste, Charles Roberts and Cuthbert Williams – all members of Dominica's National Team – were selected onto a Windward Islands basketball squad which toured Trinidad. Cardinals contributed no less than thirty-seven (37) years to the sporting history of Dominica, from 1968 through 2004, and won an estimated 25 League Championships plus several Knock-Out and Play-Off championships, giving up only to Pros, Flames in the 1970s, J.K. Eagles in the 1980s, and Blazers and Knicks in their twilight years. Several of their game-scores ended in triple-digits, and according to LeBlanc, "Cardinals always used to go for the 100-points mark". To this Thomas added, "From a defence stand point, my main aim as a coach was to keep our opponents down to 40 points or less." In their heyday, Cardinals had quite a fan-base, including several die-hard supporters. Reminiscing a bit, "Plastic" and "Kiwi" noted that two of the team's biggest fans were Ms Ervinia Jolly - sister of Fr Clement Jolly - and retired national footballer Cecil "Abou" Elwin. In the "good old days", the team enjoyed traveling to Grand Bay to engage Bata Pros in "friendlies". De Ency's 1982 crown-winning Road March calypso had said, "There'll never be another team like Harlem" (…'Bombers' football team, formed two years after Cardinals, now 47 years old). 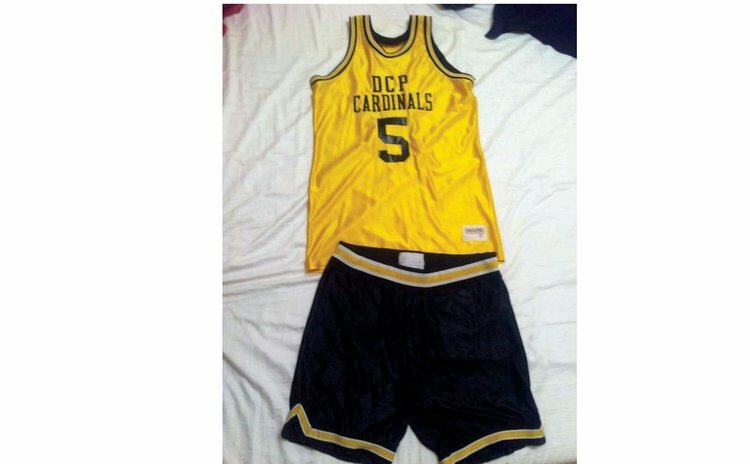 But, we can safely ask, "Will Dominica's basketball fraternity ever see another team like Cardinals?" Information presented above was obtained mainly from archived local newspapers and from a joint discussion with Wilmoth LeBlanc and Bernard Thomas.